The prediction is typically set with enough room for the actual reading to exceed it. Real GDP grew 9.2% in 2011, with the fourth quarter recording only a 6.8% increase. 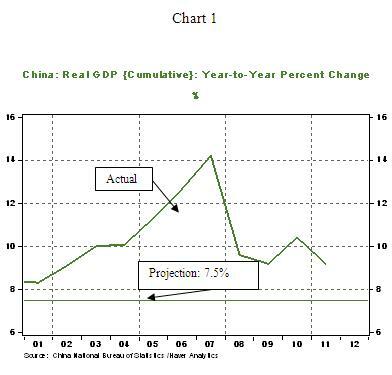 The IMF has projected a 9.0% increase in China’s real GDP and a 4.0% gain in world GDP during 2012. 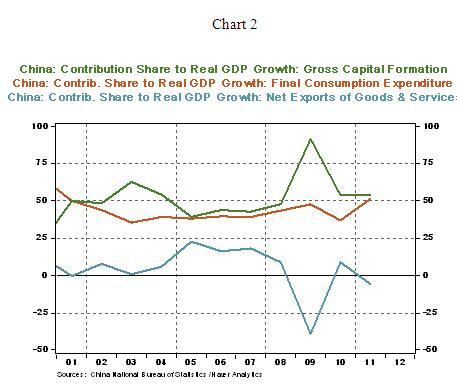 Mr. Wen also pointed out “expanding consumer demand is essential to ensuring China’s long-term, steady and robust economic development.” Consumer spending is roughly 45% of China’s real GDP in the past ten years (see Chart 2). Mr. Wen is signaling a shift in emphasis away from exports and investment expenditures. However, it is not clear how Chinese authorities can steer the economy toward this goal; this is more of a long-term rather than a near-term objective. The announcement today shows a 4.0% inflation forecast for 2012. Inflation in China peaked at 6.5% in July 2011. 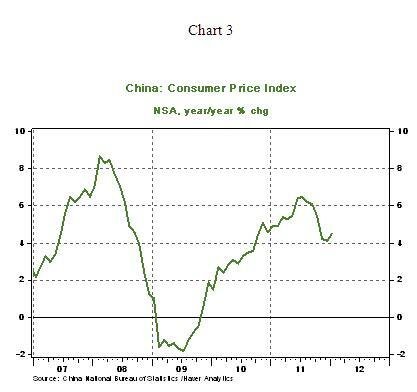 In January, the China’s CPI grew 4.5%, a solid 200bps drop in a short span. Will this trend prevail in 2013? There is a large unknown casting a big shadow on the world economy -- Iran’s nuclear ambitions have engineered uncertainty about oil prices. Any sort of military engagement in the region can upset oil markets and trigger a large cost on the fragile world economy. Therefore, Wen’s propositions about the Chinese economy include risks. If China misses the soft-landing target, the world economy stands to lose. Stay tuned for China’s latest inflation numbers on Friday, March 5.